Manufactured in Canada from 0 until 0. Gift from Alain Laflamme, whom I warmly thank. This device is one of the few (possibly the only) all-Canadian camera. There are certainly Canadian Kodak, but they can not be said to be entirely Canadian, because most of the time they are only local manufactures of English or American models. 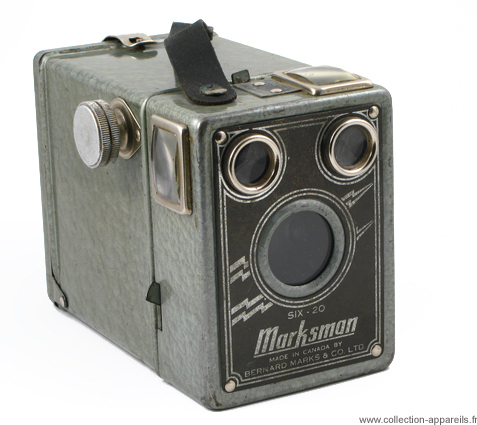 It is a technically a very ordinary box camera, made of metal, but covered with a beautiful hammered paint, green color. The only result of an Internet search about the brand "Bernard Marks" brought me to a site about anti-rust paint sold by this company in Toronto. It seems that Bernard Marks was not a camera manufacturer.